The railway system in Japan is as efficient as it is complicated. Using trains in JapanÂ is the best, quickest and most cost effective way to get to where you want to go in Japan, but it can also be very easy to get yourself lost if you’re not aware of what you are doing. WhenÂ traveling in Japan you much first realize that many of the railway lines you may wish to travel on could be owned by different companies so purchasing a ticket for each stretch of your journey is needed. An example of this would be theÂ Tokyo system, where there are two main companies and a number of smaller companies owning private lines. 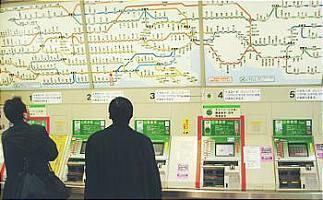 the JR East line and Tokyo Metro (or Subway) lines are separate and need two separate passes to use. Below are maps of both the JR East rail system and the Tokyo Metro. As you can see the vast number of stations and lines can be very daunting for visitors. Thankfully there are tools to sort out the best way to travel in between locations. The first of these is Jorudan, a website used by Japanese people to find the best route using the train systems from one point to another. Simply type the train station you’d like to travel from to the station you’d like to travel to on what date and it will give you a variety of different routes to take. Another tool is called Hyderdia, developed for visitors to Japan it gives the same information. If you’re planning on travelling a lot around Japan, you might consider purchasing a JR rail pass, which enables you to use any JR Rail train an unlimited number of times within a certain stay. For example, a 7 day unlimited JR Rail ticket would cost you AU$330 but you are then able to use any train on a JR railway line any number of times. This could be a money saver as a train ticket from Tokyo to Osaka for example can cost over AU$90 each way, but it all depends on how far you’ll be travelling. Express trains stop at even fewer stations than rapid trains. Japan Railways (JR) charges an express fee in addition to the base fare. Limited express trains stop only at major stations. A limited express fee usually has to be paid in addition to the base fare. It is typically between 500 and 4000 yen. JR railway companies always charge this fee, but some other private railway companies do not. Shinkansen are only operated by JR. Shinkansen run along separate tracks and platforms. A limited express fee has to be paid in addition to the base fare. It is typically between 800 and 8000 yen. Tickets for short distance trips are best purchased at vending machines, while tickets and seat reservations for long distance trips can be purchased at ticket counters in train stations. 1. Find your destination and the corresponding fare on the map above the vending machine. The map shows the train lines and stations of the region. Ticket prices are shown beside each station. 2. Insert the money into the vending machine. Most machines accept coins of 10, 50, 100 and 500 yen and bills of 1000 yen. Many machines also accept larger bills. 3. Select the number of tickets that you wish to buy. The default is one, so if you are traveling alone, you can skip this step. 4. Press the button that shows the amount for your ticket. 5. Collect the ticket(s) and change. Ticket vending machines with map of lines and stationsSometimes the station names on the maps are written only in Japanese. If you are unable to find your destination and the corresponding fare, you can purchase a ticket for the lowest possible price, and pay the difference at a fare adjustment machine at the destination station.